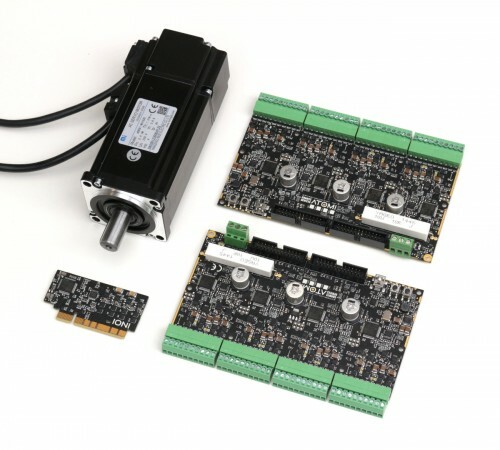 New ATOMI servo & stepper drive boards are here! Earlier announced ATOMI is finally getting the focus it deserves! Now we have second revision boards under our scope for testing and firmware development. From initial tests, we can tell that we’re very close to the final design. At the moment it looks like we need only to change one resistor value on the PCB to make it final. We can thank Esa Hippolin from the beautiful hardware design. This entry was posted in Announcement, Atomi, Hardware by Tero. Bookmark the permalink. Looking good! Would it be possible to use SinCos encoders with this board? There is encoder input but they don’t read analog values like IONI so no SinCos can be done on this device. integrated usb to simplemotion adapter? interesting product :) I’m curious to see the final specs! Yes, USB is exactly for that! Could it be possible to parallelize each 2 of the 4 elements? – With the goal of running 2 40A brush DC motors with a single ATOMI? Or 4 pcs of 40A brush DC motor with 2 ATOMI? Atomi can parallel two PWM channels as one in brush DC motor just like IONI. You could get 40A from IONI Pro HC with little help of special firmware that we can deliver (no guarantee however, haven’t tested that high so far). It’s a very nice product. Is there any progress on the development/release?